Less than a year after he was shot in the chest and both legs in the 26/11 Mumbai terror attack, Harnish Patel pulled out a personal miracle. He completed the London Duathlon -- a 34 km running and cycling race -- when six months prior to the event he could hardly put one foot in front of the other whilst recovering in a London hospital. He tells Archana Masih his amazing story. It was far from an easy journey for the 30-year-old British national who was on a backpacking trip to India. He was shot thrice at the Leopold cafe. Grievously wounded due to the bullet injuries, Harnish could barely manage to move on crutches by March and had to effectively relearn how to walk again. "When the physio presented me with the walking frame, the thing that ran through my mine was 'F**k this, I'm going to do whatever it takes to bounce back'," said Patel in an e-mail interview from Havant, UK and reveals his courageous journey back to life as he knew it. Less than a year after you were shot thrice by the terrorists at Leopold Cafe, you conquered your injuries and took on life and its challenges? Nothing beats a good challenge. A good challenge will always make you far more adaptable, resilient, confident, stronger and a more rounded as an individual. Past experiences such as distance running to climbing Mount Kilimanjaro have put me in good stead over the years. Pushing the envelope out that much further over the years has been key in setting the right attitude to cope with my recovery. Prior to the London Duathlon I had taken part in the D-Day 10K run in Portsmouth (June) and Hayling Island 5mile run (July). I ran these much slower than before, however, this is to be expected as a result of the injuries I sustained during the attacks in Mumbai. Even to this day doctors, advisors and specialist are taken back with the progress I have made in such a short period. It has been far from an easy journey. After being so grievously injured, what made you decide that you would take part in the London Duathlon and when did you decide this? I entered the event last minute. I gingerly decided to take part as I had still been suffering from peripheral nerve damage in both legs that can be very painful at times. I entered the London Duathlon as a result of some unfinished business from 2006. In 2006 I had to pull out during the transition from the run -- bike leg after picking up a puncher. I remember this day very clearly being so angry and frustrated. This made me even more determined to nail it this time around. How did you bring yourself to participate in such a grueling competition? My training for the Duathlon centered around running with limited bike training. The lack of cycling training had been partly due to my last minute decision to enter. If anything I just wanted to complete the race and less concerned with my times. It's been a slow, frustrating and gradual process getting back to full physical fitness. At first I could hardly put one foot in front of the other whilst in hospital back in the UK. The only way I could maneuver would be using my upper body and then I progressed onto a walking frame. The pain was immense causing me to really bite down and grit my teeth. Then when the physio presented me with the walking frame, the thing that ran through my mine was 'F**k this, I'm going to do whatever it takes to bounce back'. This really put things in prospective at the time as I had no idea what the end results would be, would I require a walking aid indefinitely, would I be limping for the rest of my life, would I be able to run again! Image: Harnish Patel was shot thrice in the Mumbai terror attack. Less than a year later, with sheer grit, he was participating in long distance running competitions. After leaving Hillingdon Hospital, London, I took up residence at the family home which is all very vivid with so much time spent bed-bound together with medication and daily trips to the medical surgery for a dressing changes. The three bullet wounds where still weeping for sometime after the attacks. This continued throughout December until February. During this period I would try and man over myself as much as possible to help gauge my comfort zone and ascertain how far and what I could do. At the time this would be largely stumbling on crutches to the living room, kitchen and bathrooms. Every visit to the medical surgery, I would always have another set of questions. My ultimate goal was to regain independence and see how far until I could push myself back into the physical shape possible. Once the wounds stopped weeping, the final few stitches removed and the dressings were no longer required, I started thinking about what I could do to move things forward. Running had been a long way off at this stage and I started to think about alternative options. I had not swam properly since my primary school days, other than the occasional swim on holidays. The doctor gave me the all clear and I would make my way to the local pool Monday through to Friday on my crutches heavily wrapped battling the strong coastal wind and rain, refusing to accept lifts from family and friends. I would always respond in each instance: 'The journey would do me good and I need the exercise, thank you'. Following swimming I would walk on my crutches further afield to the town centre to enjoy a sit down coffee with friends. After a couple of independent sessions I realised I needed to improve my swimming efficiency and took up a few one-to-one lessons. Swimming helped hugely and allowed my body to function physically. However, I still suffered from a lot of pain after a few laps. At first I could only manage five minutes of lane swimming and gradually built myself up to one hour thanks to the training and support from the staff at Havant Leisure Centre. I finally managed to drop the crutches in March and slowly started to walk. Still in pain and only being able to walk short distances I gradually built myself up to a level where I could walk into the town centre. This would take most people around 15 minutes. I would take around 30. Once into the town centre I would have a much-needed rest over a coffee with friends and make my way back, still refusing a lifts. The whole time walking to town and back I would push the pace and monitor my pain threshold to establish how I would be progressing. Again I would have to dig deep at times and push through the pain. On the moments of dejection, frustration and sadness. In March I had an appointment to see a specialist to ascertain the severity of the nerve damage in each leg. My main concern had been the persistent pain and whether I would fully recover. They said over time I may regain feeling providing the nerve endings reconnected with the right ends. If not, they would heal, however, feeling maybe lost. This completely broke me. I recall walking back past a field whilst on my crutches and had to contain myself from throwing them as far as possible. I arrived home and remember breaking down again with sheer anger knowing I may not regain full feeling in all or part of my legs. I later learned that exercise would stimulate the nerve endings and encourage/ stimulate growth. This made me even more determined to get back to running. At times I would be told to take it easy by doctors, family and friends. However, I knew my limits and would go that extra mile, and a bit more at times. It's good having people around you that care so much. This clearly kept me in check and made sure I look a step back often enough to be realistic about my recovery and goals. Determination is great however, you need to combine and embrace optimism with a good measure of realism. 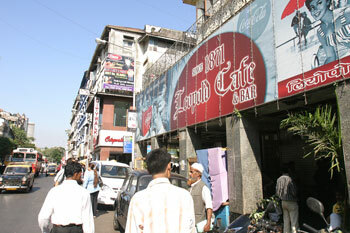 Image: The Leopold Cafe, which was attacked by terrorists on November 26. Just after coming off the crutches, I though about setting down a goal, a race to aim for. I had run the BUPA Great South Run in October 2005 and 2006 and decided this would be my target. 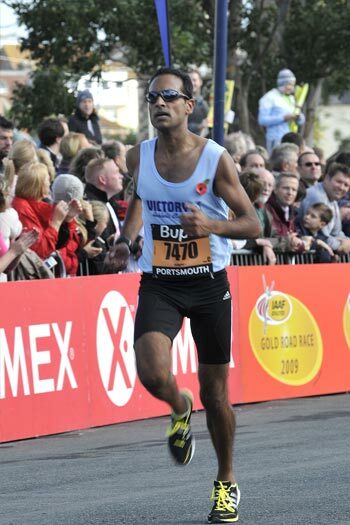 The BUPA Great South Run is the largest 10-mile race in Europe, has incredible support throughout and on my doorstep in Portsmouth, which is close to where I grew up. In October I smashed my personal best record from 2006 by 3 minutes placing me 102 from 14,000 participants. Since September (just after the London Duathlon) my running speed and times have come down dramatically. 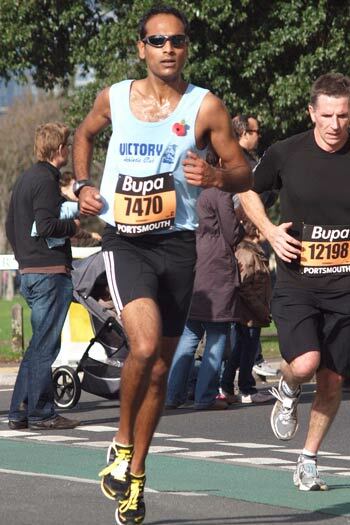 A week after in September I ran the Sony Ericsson half marathon in Greenwich London in 89 minutes, October the Solent half marathon 86 minutes and in November the Gosport half marathon in 82 minutes. In running terms taking a few second or a minute at a push is a real achievement, however, taking such large chunks of my times in such a short period is a real surprise and an achievement I am very proud of. Who trained you for the run? Who were the others -- family, friends -- that encouraged you? In May I joined the Victory Athletics Club. The first training session had been very frustrating seeing other people running much faster than myself. All that went through my mind throughout the session had been, I should be up there with the front-runners. I had been a reasonably quick runner before relocating to Hong Kong. I kept repeating to myself, you will be back up there with everyone else, I will get there. I continued training with the club on a regular basis despite the pain in both legs, nothing serious, just scar tissue and nerves being pushed a bit harder than expected. In August I also started boxing at Leigh Park ABC once a week. Both Victory AC and Leigh Park ABC have been brilliant. Everyone has been so helpful and supportive. They continually keep me in check and offer sound advice. In July one of my coaches even sent me home when my right foot started to swell, I would have not run but it's good knowing that they have your best interests at heart. The problem had been with my lymphatic system and one of the many unexpected hurdles I have had to overcome throughout my recovery, just when I thought everything had been going so well. The problem with my lymphatic system had stemmed from residual fluid in my right leg and took a few weeks to bed down. What provided you with the greatest source of encouragement? All my family and friends have provided me with so much encouragement and support to pursue what I felt was right. All I have done is kept my head down and kept plugging away. Looking back, in a positive light I have achieved so much in such a sort period. This has only just started to hit home now. I appreciate these accomplishments so very much however, they like the Mumbai attacks are done, out of my control and in the past. I have to continue to move forward and continue to focus on whatever challenges lie head in life in the best way I can. None of this would have been possible without the help, support and guidance of those around me who I respect and am so very thankful.